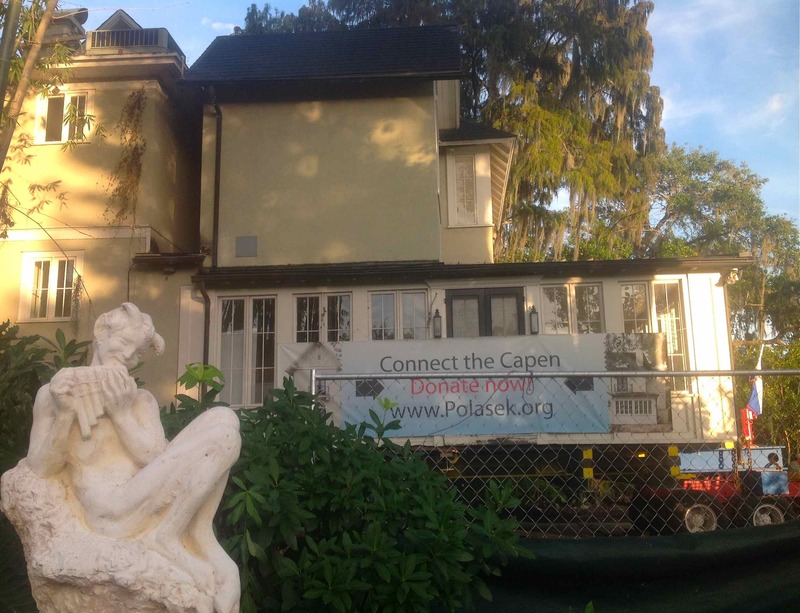 Half of the historic Capen House rests after its move in Winter Park, Fla., near a statue of Pan at the Albin Polasek Museum and Sculpture Gardens. By the time I could make it to the shores of Lake Osceola on December 10 to pay my respects, Madame Capen was resting comfortably in her new digs – at least half of her, weighing in at 100 tons. 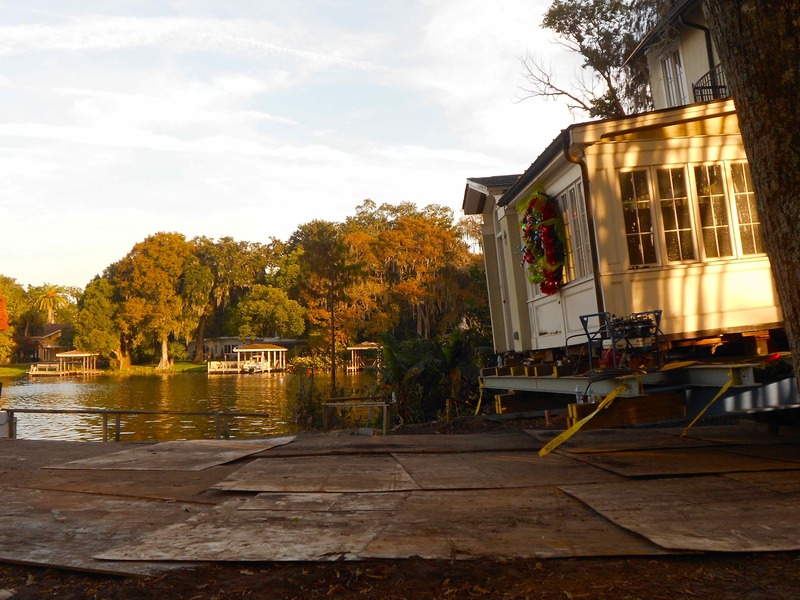 Earlier in the day, this grand dame of Winter Park homes, age 128, made the journey across Lake Osceola by barge, to rest until a move to a permanent site on the grounds of the Albin Polasek Museum & Sculpture Gardens. In the late afternoon sun, the house looked right at home amid the bougainvillea and bamboo. Other late arrivals stopped by to snap photos and marvel. A young mother wheeled three youngsters in a triple-seat stroller so they could see a historic happening. One photographer floated in the lake in a kayak to get a good shot. 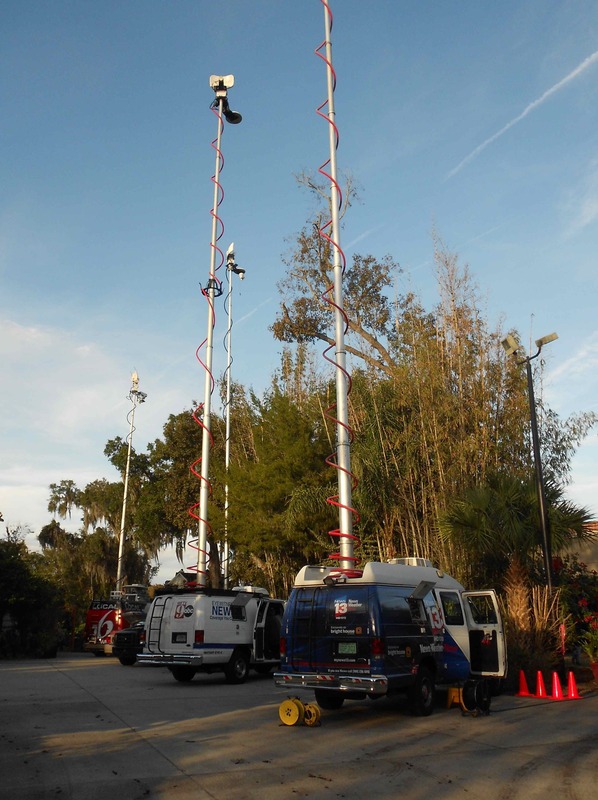 TV trucks lined the driveway of the Polasek, ready for their 5 p.m. broadcasts. 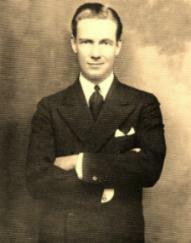 The man who built the house, James Seymour Capen, helped Winter Park begin. When he later looked back on his family’s arrival in 1884, he could list the people who constituted the community then on one page of stationery. In the decade after the family’s arrival, Capen raised citrus, helped organize the Orlando-Winter Park Railroad Co. – the beloved Dinky line – was secretary of the venerable Winter Park Land Co., and donated land to Rollins, of which he was a trustee in 1887. 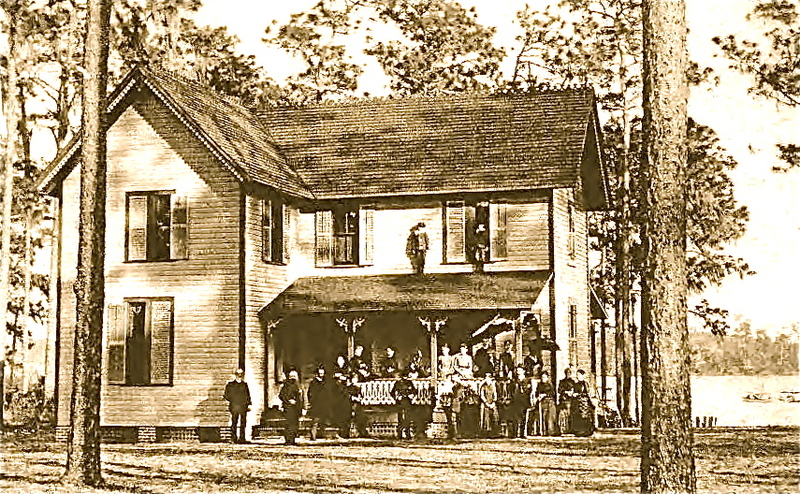 An age-worn photo shows the 1885 house surrounded only by pines, with Lake Osceola in the background. 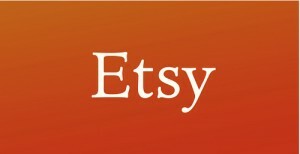 The women wear long, Victorian-era dresses. In a display of youth’s timeless spirit, two boys perch on the porch roof. It’s remarkable for such a house to have survived from 1885, in our hot, wood-wearing climate and our Florida penchant for ever tearing down and building anew. But the Capen House has survived, thanks to care over the generations and a remarkable effort in 2013, when it appeared to be doomed. All fans of preservation have much cause to celebrate and cheer the many who are making this a great example of how to save and reuse our historic buildings. Those of us who missed seeing the house float have another chance, later this month. My family are railroad people, no strangers to the Orlando passenger station on Sligh Boulevard. After the traveler among us has climbed up into the train, we wave at the long windows sliding by, vanishing into the horizon. Sometimes we go there just to take photos. 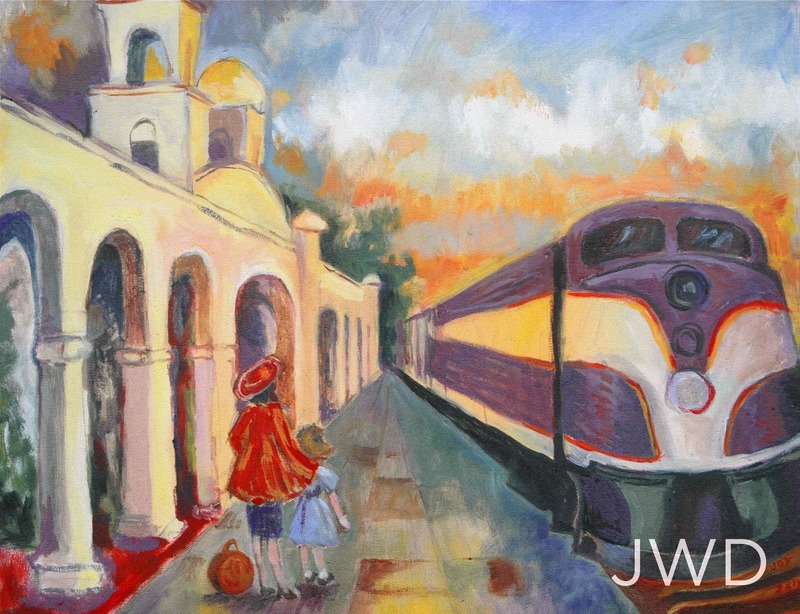 Much has changed since the station debuted with a roaring big celebration back in the Roaring ’20s, but the old Spanish Mission station, designated a city landmark in 1977, has remained a working part of America’s railroad heritage, and its new role as a SunRail station has given it a brighter future. 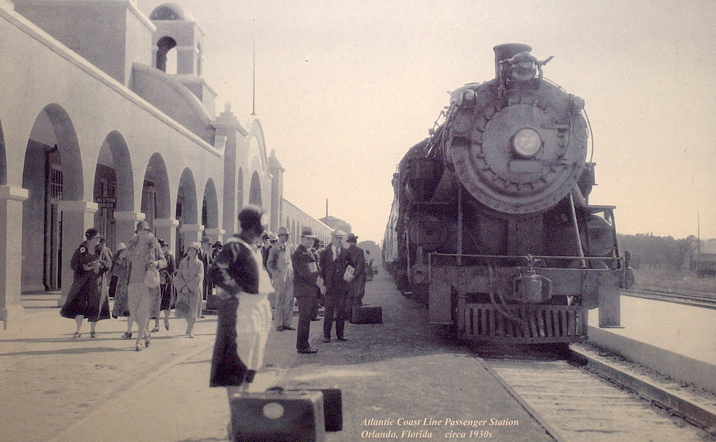 When Atlantic Coast Line officials planned the station in the mid-1920s, they sent architect A.M. Griffin to California to study the Spanish missions in cities such as Santa Barbara and San Juan Capistrano. With its twin bell towers, arches, and tile roof, the station became the Atlantic Coast Line’s very Pacific Coast-style gift to Orlando. It survives as the sole Mission-style station in Florida. 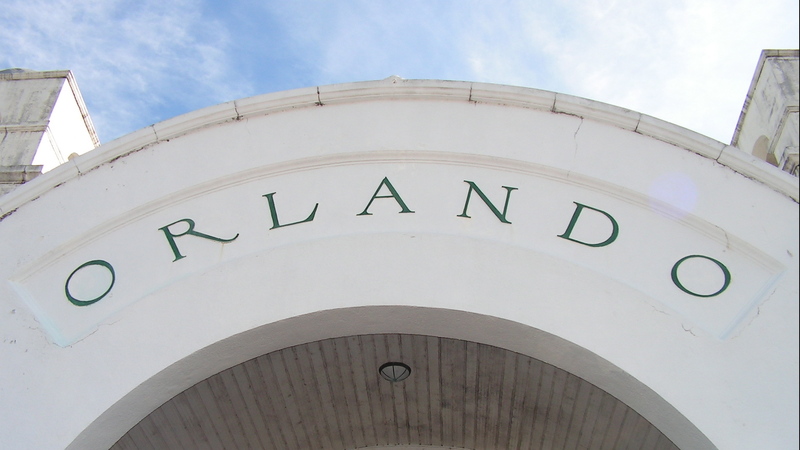 One of the station’s finest features remains the curved rendering of the word “Orlando” over the entrance facing the trains. It doesn’t hurt that the city’s name is pretty in itself. The folks who picked it back in 1857 must have known it had more marketing potential than its predecessors, Fort Gatlin and Jernigan. I also love the colonnade of arches that extends out from the station. There our family would wait in the 1950s and ’60s for visitors from western Pennsylvania, our particular slice of up North. Among them were my Northern grandparents, Florence and George Dickinson, always decked out in their best: For her, hat (with silk flower), gloves, corset, suit, stockings, high-heeled pumps, serious purse and the little suitcase called a train case. Granddad wore a snappy fedora, starched dress shirt, double-breasted suit, pocket handkerchief, polished shoes. Orlando’s Atlantic Coast Line station bustles in the 1930s. Courtesy of the Orange County Regional History Center. You dressed for travel then. It was an occasion. And my Granddad Dickinson wouldn’t have traveled any other way except by train. He was an engineer for the Pittsburgh and Lake Erie line. Not too many years after he wore his double-breasted suit to visit Florida, he would depart this world at the throttle of his engine during heavy snow, the victim of a heart attack. His last act was to stop the train safely. The railroad gave my grandmother a gold watch to honor that. 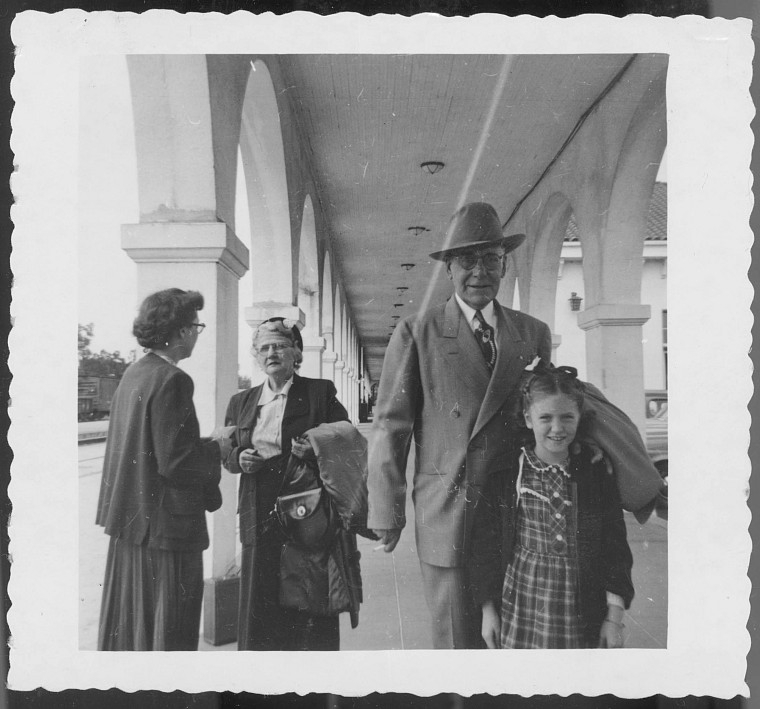 Granddad would be happy to know that people are still traveling to Orlando by rail, on trains that bear names from his era – the Silver Meteor and the Silver Star – names that still trail a hint of adventure. And he would be happy about the survival of a station where thousands of travelers – old, young, rich, poor, black, white – have come and gone over the years, as they rode their father’s magic carpets made of steel. 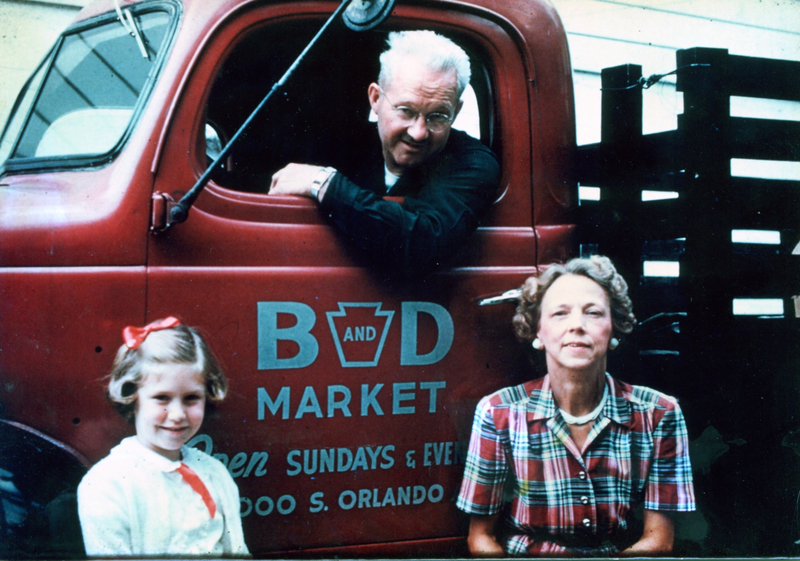 Joy Wallace Dickinson (left) about 1950 with grandparents Bill and Alice Wallace and the truck for the family’s new business, the B&D Market in Winter Park. Welcome! 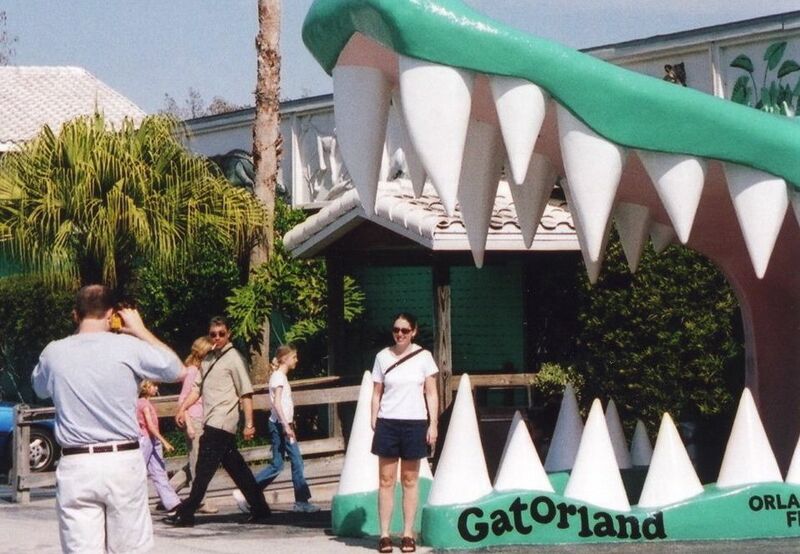 If your memories or interests include sandy beaches, orange blossoms, and all that’s old and “real” Florida, I hope you’ll find this a fun, interesting spot to perch every so often in your travels across the vast, astonishing worldwide web. I love writing about Central Florida’s past, and my heart remains there, even when I wander. Right now, I’ve wandered on a visit to California, where I once lived. I’ve been reunited with three dear women friends to celebrated friendships forged more than 50 years ago, at Orlando’s Howard Junior High School. 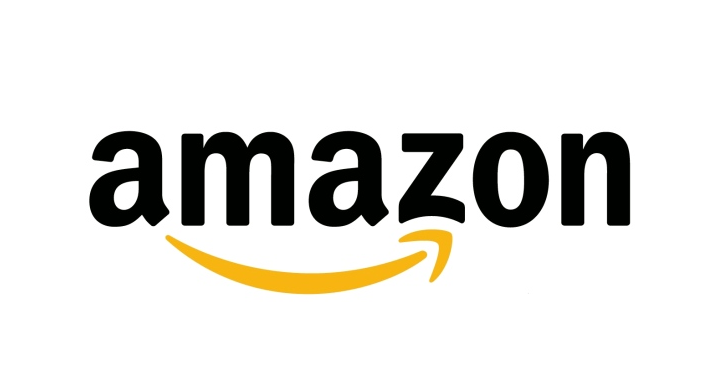 My ties to one of these friends, Debbie Staton Cook, reach back to a bond forged between our families in the 1940s when her uncle, Ted Staton, sold my grandparents the house in which I now live. We four have talked a lot about how our youth in Orlando shaped our lives: about the teachers who inspired us, about good times at the Central Florida Fair, playing records at Bill Baer’s on Orange Avenue, about trips to the beach, about listening to our teacher read us The Lion’s Paw in elementary school. And yes, we’ve probably talked, too, about the pumpernickel rolls at Ronnie’s restaurant. I carry my Central Florida past with me wherever I wander. I admire folks whose roots go deep into Florida’s sand, and I cherish too my heritage as one whose family came from the North, from the steel country of Pennsylvania. My father and grandparents traveled in my granddad’s woodie station wagon, but my mother and I journeyed by train and arrived at the Sligh Boulevard station. Modeled on the missions of California, this 1920s station remains my most-loved Orlando building. Especially for my grandfather, Bill Wallace, Orlando was truly a city of dreams. Back in Pennsylvania when I was a small child, he often asked me, “Now, where are you going to go to college?” And I would respond with the much-rehearsed, “University of Florida.” In the end, my college was Florida State, but it was all the same to him. It was in Florida, his final and best-loved home. May we never forget its history, including the parts that may be difficult to embrace and understand. In this space, my goal is to embrace my name (not always easy) and focus on what’s joyful in Florida and beyond. We’ll probably venture into wide-ranging subjects including travel as a single, older woman; books, especially cozy mysteries; Florida-related art and pop culture; vintage roadside signs and other uses of typography; Orlando’s historic Lake Eola Park; the other sunshine state, California, so like and so different from Florida; writing tips and inspiration; and the occasional historic or family recipe. And maybe even coffee. This is one writer who is fueled by coffee. Let’s have a cup. I’m so happy you’re here.